As next step click through the tabs of the Brick Viewer to see if the Bricklets are working correctly. Now you can be sure that the Bricks and Bricklets have versions that work together. 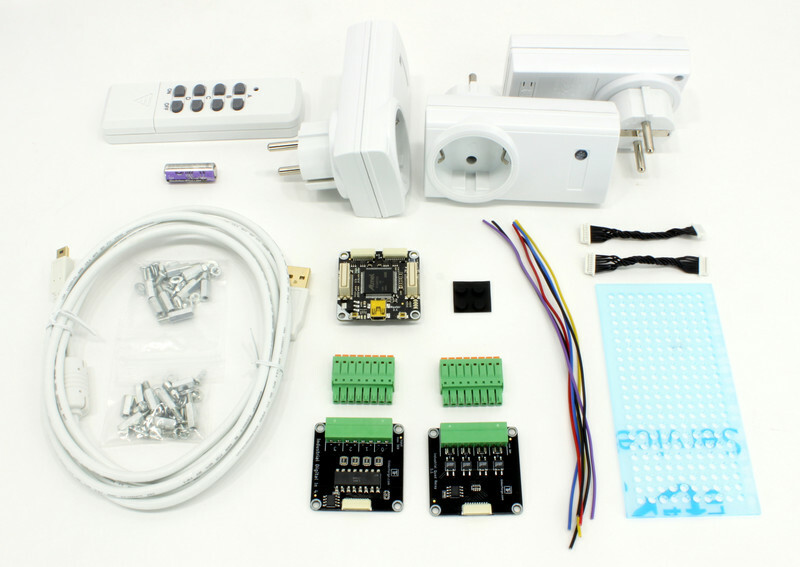 Basically there are two different options with this kit: Detect digital signals and short-circuit signals. A detailed description of the basics can be found in the Hardware Hacking for Beginners tutorial. Keep voltages in mentioned limitations and don't hack devices which are supplied by dangerous high voltages (e.g. mains voltage)! If you want to read out the state of an electronic device, often there is a voltage source somewhere that represents this state. 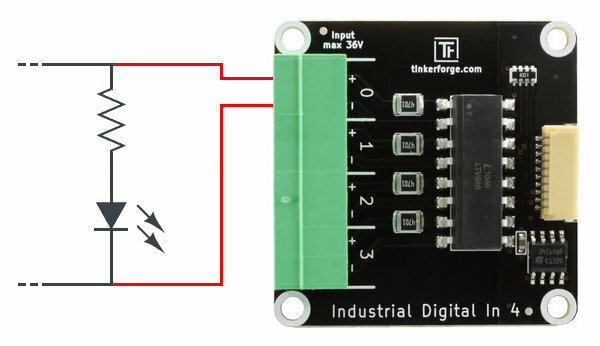 If it is a digital signal and the voltage is below 36V, you can connect the Industrial Digital In 4 Bricklet to it and read it out. A good option are LEDs. If your device has an LED representing a state you can easily read the state. It is important to keep in mind that a high signal level is detected starting at 3V and a low signal level is detected below 2V. In between the behavior is undefined. 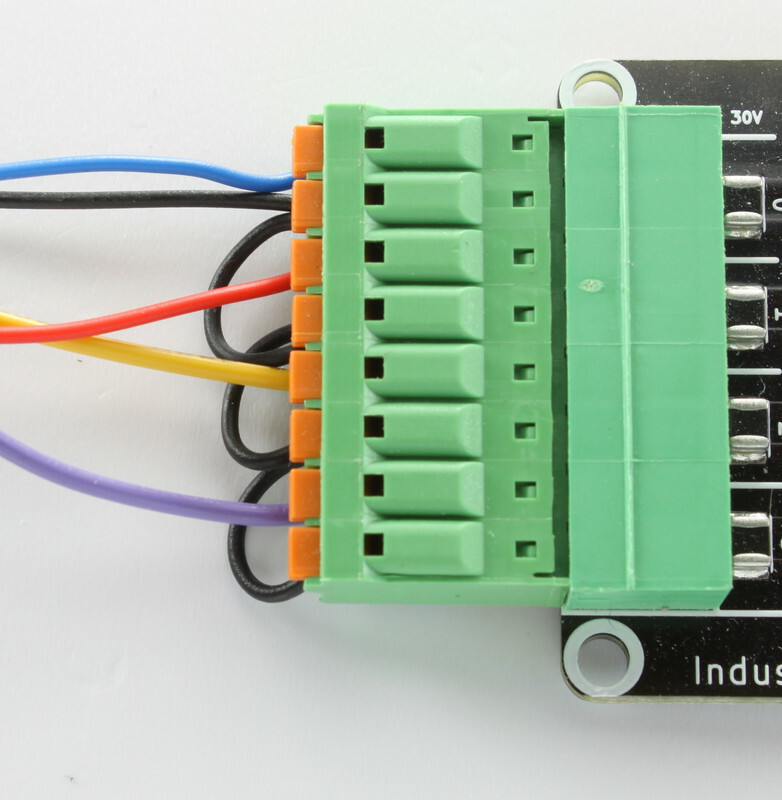 To read out a signal, connect it to one of the input ports of the Industrial Digital In 4 Bricklet. If you don't see any reaction of the input port in the Brick Viewer you likely have to reverse the polarity of the input. You can find the correct polarity by trial and error, the Bricklet is protected against reversed polarity. Below you can find a connection diagram that shows a possible setup if you want to detect the state of an LED. The series resistor is included to obtain suffice levels for high/low detection. 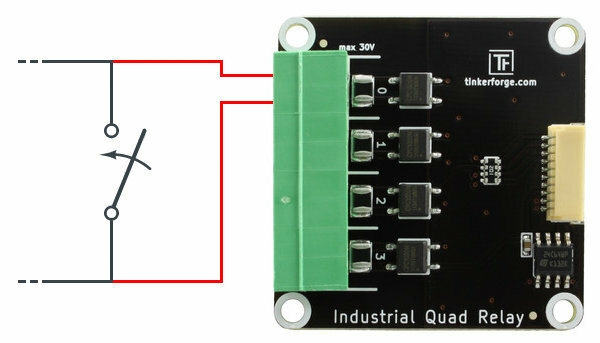 With the Industrial Quad Relay Bricklet you can switch (short circuit) signals. 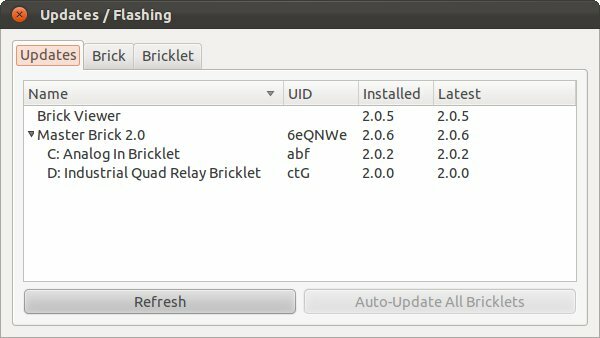 Many devices have switches or push buttons that can be hacked with this the Bricklet. Remote controls are good examples. Below you can find a connection diagram that shows a possible setup if you want to operate a switch with the Industrial Quad Relay Bricklet. 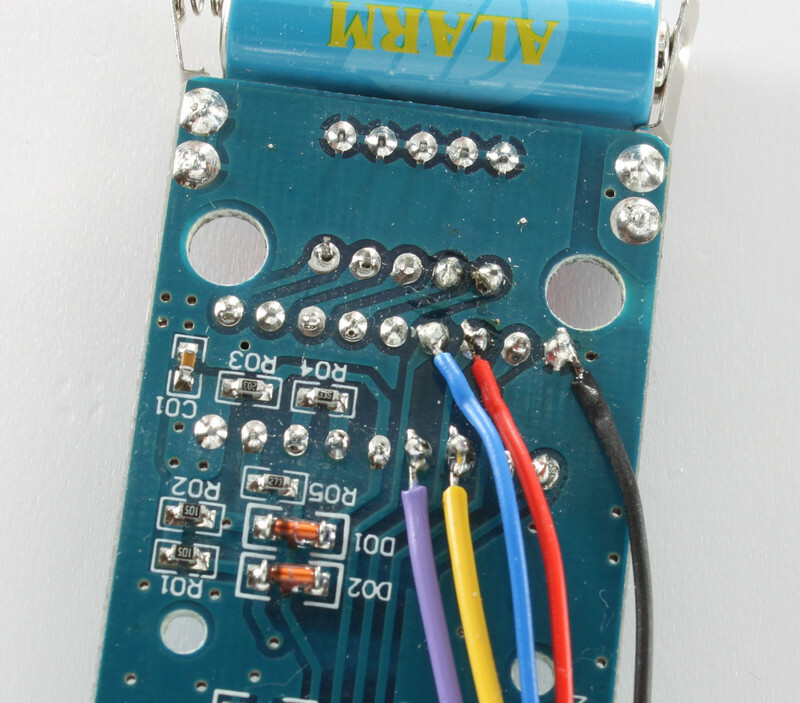 Find solder pads that can be used to measure or switch a voltage. Solder wires to these pads. If you have never done this, take a look at the Hardware Hacking for Beginners tutorial for an in-depth guide that explains both steps. 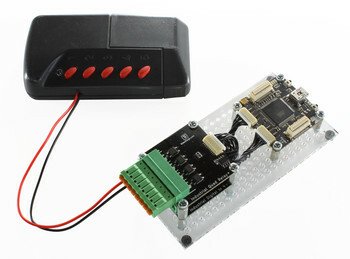 This kit includes the remote switch set ELRO AB440WD/2. These remote control mains switches can be used as a first step towards home automation. We are going to hack the remote control of these switches and connect it to a PC to create software controlled remote switches. 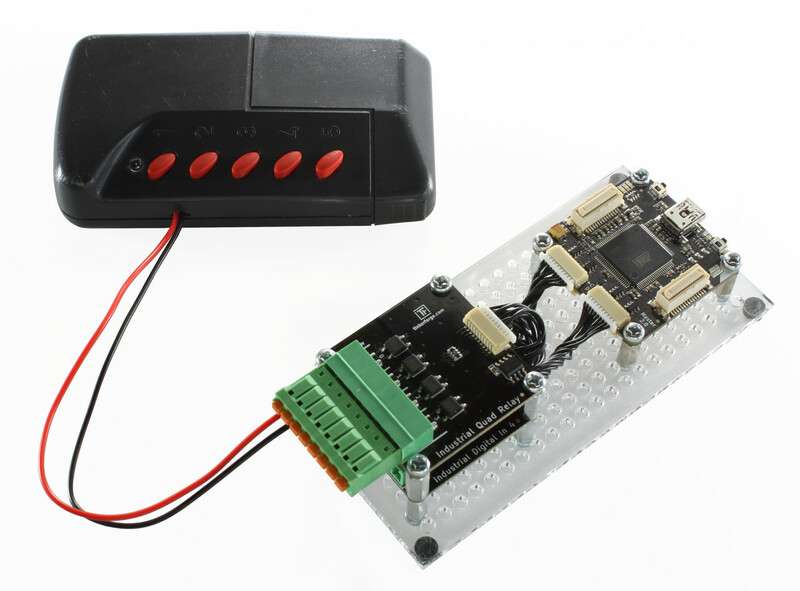 We connect an Industrial Quad Relay Bricklet to the buttons of the ELRO AB440RA remote control. There are a vast number of remote switches available on the market. Most of the commercially available remote controls use the HX2262 IC with the same hardware design as the ELRO remote control. So this guide can be applied to most remote switches. The full description of the hardware setup can be found here. Example apps for Android (Java), Windows Phone (C#) and iOS (ObjC) are available. An example implementation of a GUI (compatible to Windows (.NET), Linux (Mono) and macOS (Mono)) is available in C#. 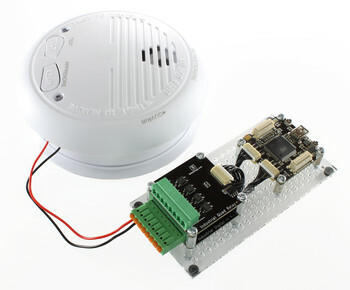 Wirelessly interconnectable smoke detectors allow to read out the alarm signal of a whole smoke detector network at a single point. 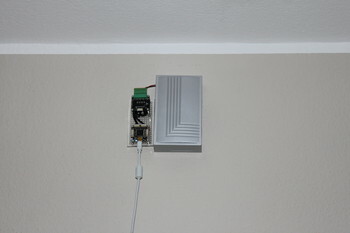 We are going to hack such a smoke detector and utilized this feature to trigger actions if smoke is detected. 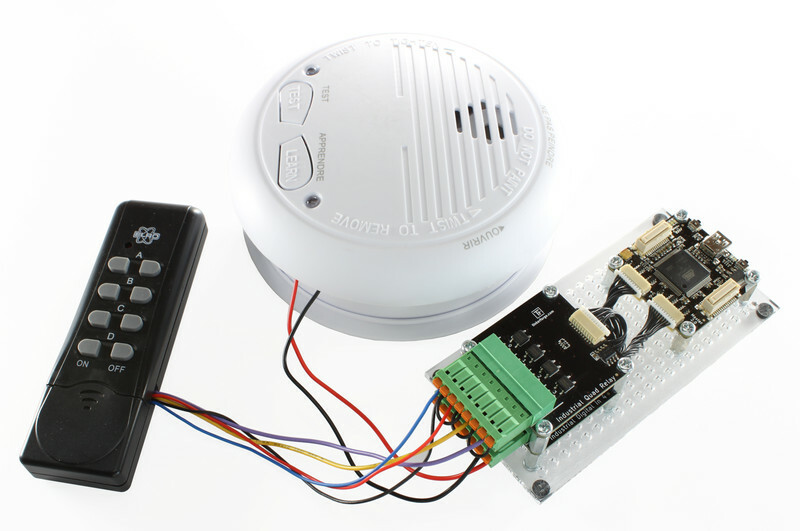 For example, notify someone with an email or a text message about the alarm. For this project we use the wireless smoke detector set ELRO FA20RF/2 and connect an Industrial Digital In 4 to one of its LEDs that light up during an alarm. Garage door openers are quite useful. Typically they come with a remote control and we are going to hack one. 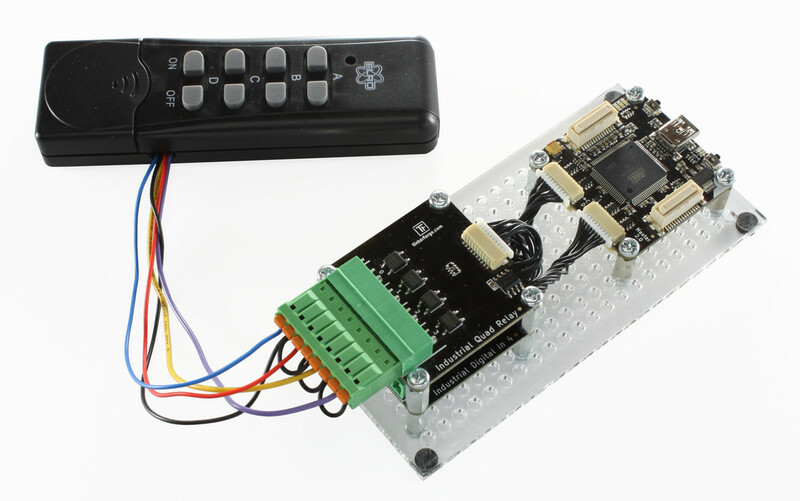 After the hack your smart phone can control the garage door and you don't need to carry around the original remote control anymore. This project is based on this project. A small description of the hardware setup can be found here. In this project one port of the Industrial Digital In 4 Bricklet is connected to a typical 12V driven doorbell. A Python script prints "Ring Ring Ring!" if someone actuates the doorbell. 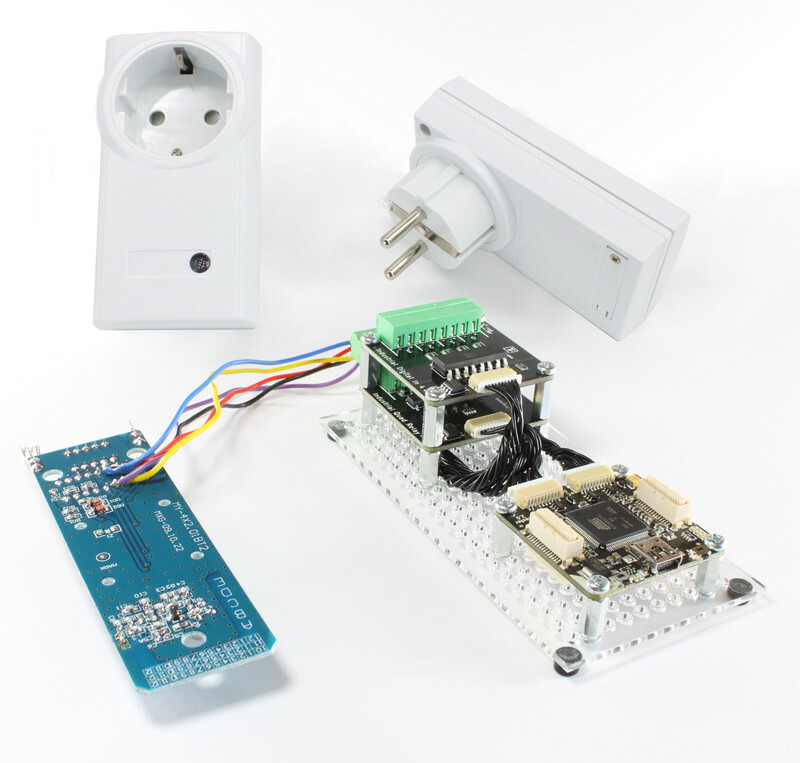 You can extend this project such that it will send an SMS or let your phone ring if someone is at your door. Be creative! Description of the hardware setup and more pictures can be found here. An example application is available in Python.